Citation: C N Trueman "Berlin after 1945"
The victorious forces at the end of the war divided Germany into four zones. They also divided Berlin into four zones. Each of the victorious nations controlled one zone and one sector of Berlin. The Allies (Britain, America and France) ran their zones differently to the areas controlled by Russia. Russia wanted to keep Germany as weak as possible to ensure that Russia itself was never attacked again by Germany. They also took from their zones whatever was needed by Russia so that it could be used in Russia itself. This way, Russia could start to rebuild itself at Germany’s expense and the Germans would be kept poor. The Allies believed that a strong Germany would enable democracy to prosper after the years of Nazidictatorship. They also believed that Europe needed a strong Germany so that their economies would prosper. To enable their zones to work more effectively, the British, Americans and French decided to amalgamate their zones into one unit and introduced into that one unit a new currency – the Deutschmark. All four occupying forces had agreed to inform one another if changes were going to be made in their respective zones. This the Allies failed to do with regards to Russia. The biggest problem for Stalin was that the German people of the Russian controlled block could not see the prosperity that was occurring in the other zones – but they could see the difference in Berlin as three of the zones in Berlin were controlled by the Allies and prospered accordingly. Therefore, to Stalin, the Allies being in Berlin was the problem. He needed to remove them from Berlin and have a Russian controlled city as opposed to a segment of that city. Stalin could not forcibly remove the Allies – he still had to reckon with America having the A-bomb and Russia did not in 1948. He therefore ordered the closing of all rail lines, canals and roads that entered west Berlin through the Russian sector. This cut off supplies of food and fuel. The only way for the Allies to supply their sectors in Berlin was to fly in supplies. Stalin would not dare to shoot down Allied planes with America’s atomic supremacy. 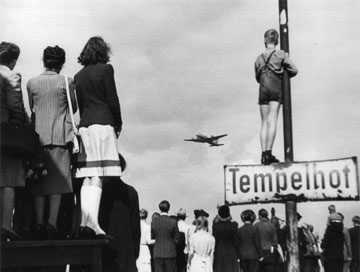 Flights into Berlin lasted for 11 months and when in became clear that the Allies would stand firm, Stalin gave in. The Allies remained in their sectors in Berlin.